I've got a super easy and yummy treat for you today! There are so many ways you can do this to help cut down on your time and work effort in the mornings, because I think most of us are b.u.s.y in the mornings, right? Brown up your sausage and add your herbs and seasonings. Meanwhile lay out your crescent rolls, not in triangles but make one big rectangle and press seams together. 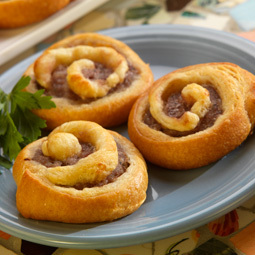 Spread your softened cream cheese onto the crescent rolls and then add browned sausage. Now, roll everything up just like you would if you were making cinnamon rolls. Slice and place on a baking stone or a cookie sheet. Bake at 375* til the crescents are nice and brown. Serve with some salsa or some fruit for a fantastic breakfast! Have the sausage browned ahead of time, or if you have it browned and put in the freezer, let it thaw beforehand. Assemble the pinwheels and cover tightly with plastic wrap the night before and then bring them out the morning of and let them come to almost room temp before baking. Here is a recipe for crescent rolls that my friend Angel posted. Knead into dough, and place in oiled bowl. Let rise until doubled in size. Roll dough into 20 inch circle and cut into 16-20 wedges. Roll into crescents and bake for 12 minutes at 375. This recipe looks great. I love the fact you gave a recipe for crescent rolls. I now it is more convenient to buy the tube but I am a from scratch cook. I need to start buying butter again. So I can make crescent rolls more often. My youngest son who is now 7 was allergic to dairy. He recently outgrew it and I keep forgetting that I can use dairy in my cooking again. After 7 years of not being able to use dairy it is hard to break the habit!